The Preschool years are the beginning of a strong foundation that molds children as individuals for the rest of their lives. 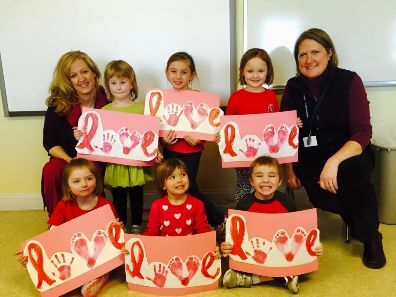 St. Rose Preschool offers a developmentally appropriate early childhood education. We are child centered with opportunities for individual, small group and whole group instruction, as well as spontaneous play and teacher guided activities. Walk through the doors of St. Rose Preschool and enter a world of light, learning and love. Dedicated, innovative and professional teachers create a nurturing environment where social, emotional, cognitive and physical growth are nurtured. Our program encourages children to discover themselves and God’s world in educational, creative and engaging ways; we prepare them academically and socially for a seamless transition to Kindergarten and beyond. The dynamic curriculum includes music, art, science, fine and gross motor development, language skills (Spanish and Mandarin) and social interaction, giving young children exposure and experience that is vital to their growing minds. A Buddy program pairs Preschool students with fourth graders for learning adventures that take them out of the classroom and into the main school for assemblies, reading sessions and cultural arts activities. THREE-YEAR-OLDS – 2 and 3 Day options; 8:45-11:45 a.m. FOUR-YEAR-OLDS – 5 Day, Full Day Program (with a Four Day Option), 8:45-1:45 p.m. STEP UP TO FIVE-YEAR-OLD CLASS – Five days, 8:45-1:45 p.m.
Extended hours (until 2:45 p.m.) are available to children in the 4-Year-Old and Step Up programs. Students who stay until 2:45 p.m. are eligible to attend our After School program. Please inquire about details. Contact admissions@stroseschool.com or call 203-426-5102 ext. 13.